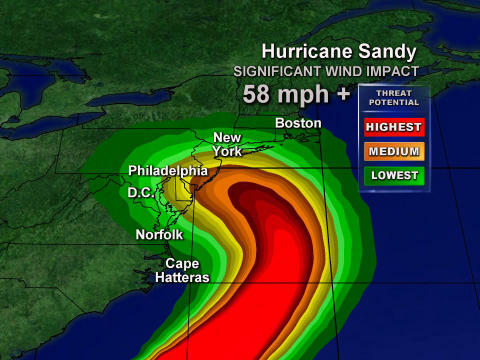 ScienceDaily (Nov. 1, 2012)  A team of researchers at Johns Hopkins and Texas A&M universities spent days tracking Hurricane Sandys power outage potential as the storm made its deadly march up eastern seaboard. Seth Guikema, an engineer at Johns Hopkins, and Steven Quiring, a geographer at Texas A&M, fed weather forecasts as well as real-time and historic hurricane data into a computer model to predict the total number of power outages. Howd they do? Their predictions were accurate overall, when compared with figures released by the federal government on actual outages. The researchers initial outage estimate, released on Saturday, Oct. 27, was that approximately 10 million people could be without power due to Sandy. The final estimate, released on Monday, Oct. 30, was for 8 to 10 million people to lose power. The team has now conducted a preliminary comparison with outage totals reported by the Department of Energy Situation Report for Wednesday, Oct. 31, at 3 p.m. EDT. The DOE-reported peak outage total was approximately 8.5 million customers. The predicted fraction of people without power was within 8 percent of the DOE-reported percentage of customers without power for the states of New York, Rhode Island, Virginia, Massachusetts, and Pennsylvania. The model predicted that a higher percentage of customers would be out in Maryland and Delaware than were actually without power, likely due to lower-than-expected wind speeds in these areas. The model predicted a lower percentage of customers out than were actually out in both Connecticut and New Jersey. Guikema (pronounced Guy-keh-ma) and his team have developed a computer model built on outage data from 11 hurricanes to estimate the fraction of customers who will lose power, based on expected gust wind speed, expected duration of strong winds greater than 20 meters per second, and population density. Guikemas model may help power companies allocate resources by predicting how many people will be without power and where the most outages will take place, and it provides information that emergency managers can use to better prepare for storms. Guikema, an assistant professor in the Department of Geography and Environmental Engineering at the Johns Hopkins Whiting School of Engineering, says the goal is to restore power faster and save customers money.